I loved this book, I couldn’t put it down once I started reading it. 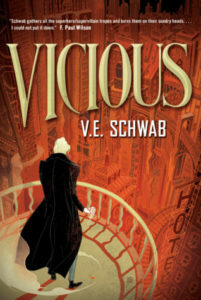 Schwab is a great author (wrote the Shades of Magic series set in multiple parallel Londons). I believe this is one of her older books which recently was republished in the US. The idea is that some people are EOs – extraordinary – have a “superpower” that resulted from a near-death experience. The powers are varied – healing, controlling people, raising the dead, etc. College roommates Victor and Eli set out to study EOs by turning themselves into EOs. They accomplish their goal, but there is lots of collateral damage. This sets in place a lifelong battle of former friends turned arch-enemies. The characters are great (each superpower works perfectly into the story) – from a 12 year old girl to a pathetic loyal dog to an injured Vet to a computer hacker. The clever plot unwinds perfectly – alternating between the present and Victor and Eli’s time back in college. Despite the fantastic elements (the superpowers), the story is realistic. I recommend it event it you don’t usually read fantasy. There are great themes in the book – good vs. evil (with some religious elements), friendship, and family. It is one of those stories that would make a great movie as the descriptions and plot are so well drawn. There is a sequel out and a prequel (prequel is a short story). I am looking forward to reading the sequel and more of her work (I have to finish the Shades of Magic series also). Share the post "Are you Extraordinary?" Lover of libraries and books. Author groupie.